Here at Control Room Recordings we feature Analog only synthesizer recordings and â€œone offâ€ and â€œspecialâ€ projects. Our last release was from The Human League and we are pleased to be following that up with another titanic group from the 80â€™s; Visage. Following the tragic death of Steve Strange in Feb 2015 Visage and Steve Strangeâ€™s family are planning a series of events to honour Steveâ€™s life and commemorate the impact that he made on the worlds of fashion, music and style. One of those events is the fifth and final studio album from Visage. As a bridge between the highly successful fourth album â€œHearts and Knivesâ€ and this future album we are pleased to be releasing a vinyl only special single. On side A we feature an extended version of one of the highlights of the Hearts and Knives album the track â€œLost in Staticâ€. This previously un-released mix will not be available on CD. It takes the moody, foreboding but uplifting original and extends it to a 10 minute synthesizer epic. The song was written for the 2013 comeback album and Steveâ€™s lyrics talk about a time away in isolation only to return once more into the fray. Robin Simons uplifting and shimmering effected guitar works in perfect unison with the foreboding synthesizer bass lines and progressive pad chord pattern. On side B we are also pleased to feature an exclusive track made for the dancefloor, â€œSeven Deadly Sins Part Twoâ€. 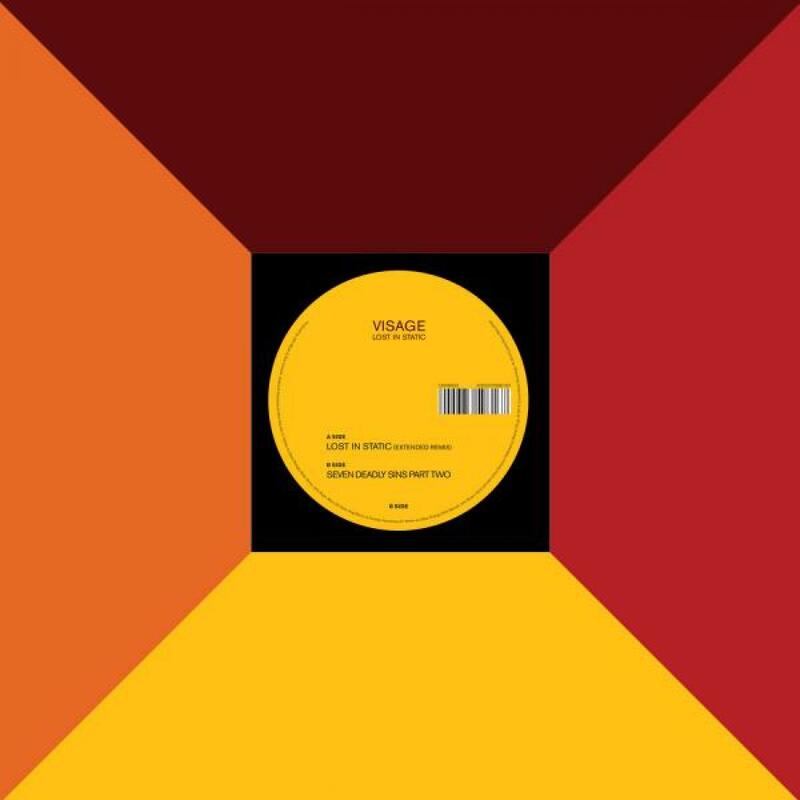 In 1981 Visage remixed their first single â€œFrequency 7â€ for the dancefloor. The rhythms were big, the PPG waves oscillated big and electro reigned. Several years later Visage again once again make a track for the dancefloor. Seven Deadly Sins again mines a deep electronic mine. It adds in driving System 700 bass, CR78 beats and darting synthesized riffs. Guest contributor then Mick Macneil dusts off his old Korg 770 for a solo reminiscent of his early 80s work with Simple Minds. Visage History: Visage began in 1978 when Steve Strange and Blitz Club partner-in-crime Rusty Egan joined forces with Midge Ure to create a futuristic, synthesizer-led group where style and fashion were matched by experimental but accessible music. The group was soon augmented with members of Magazine (John McGeoch, Dave Formula and Barry Adamson) and Billy Currie. They recorded their first single Tar with Martin Rushent at his Genetic Studio in 1979 (shortly to become the birthplace of the Human League Dare album). Their breakthrough track â€œFade To Greyâ€ became a European hit and reached number 1 in eight countries in 1980. The band then enjoyed a series of hit singles â€œMind Of A Toyâ€, â€œNight Trainâ€ and â€œThe Anvilâ€ coming from a pair genre defying albums, the eponymous â€œVisageâ€ in 1980 and â€œThe Anvilâ€ in 1982. In 1981 Ultravox now led by Midge Ure took off and in 1982 Midge and Billy left to concentrate on what would become one of the biggest bands of the 80â€™s (Ultravox). In 1984 Visage made their 3rd album â€œBeatboyâ€. As the public face of the band Steve Strange shot to stardom throughout Europe he continued to be active in hosting club nights (The Camden Palace, Club For Heroes) and in the fashion world. The fourth Visage album â€œHearts and Knivesâ€ was released in 2013 to universal acclaim. The fifth and final Visage album is released in November 2015. Produced by John Bryan and Sare Havlicek. Additional Keyboards by Mick Macneil. A1 Written by Steve Strange, Robin Simon, John Bryan, Marco Di Carlo, Greg Benns, & Christian Kennerney.